KubeBath was founded with a vision to develop products based on the concept of sustainability. Our dedication to those principles, and philosophy of manufacturing with the lowest possible impact on the environment, while using the most advanced technologies, have made our company a reference point for the bathroom industry. 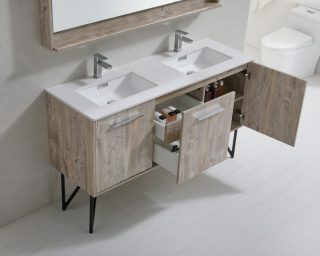 All KubeBath furniture is formaldehyde free. We strive to help make your store stand out by developing a unique product mix, helping to build your store’s identity and bringing customers through the door. In this extremely competitive market, your company has to offer unique products of the highest quality at the most competitive prices. We have distribution warehouses in USA and Canada, where we have most of our products in stock and ready to ship. Drop-ship is also available for online retailers and efficient and well trained staff will have your order ready to ship within 48 Hours of receiving P.O.’s. Drop-Ship orders on LTL shipments are fully Inspected, properly packed and secured on a pallet to prevent damages during transit and guaranty customer satisfaction.